The wines of the Appellation d'Origine Contrôlée Faugères come from a regular schist soil. This geological nature of the soil makes it possible to retain the rainwater at depth and to store the heat of the sun. The Mediterranean climate adds to these ideal conditions for the cultivation of the vine. Although the vast majority of Faugères are red, the AOC also includes rosé wines and white wines. The vineyards of Faugères stretch over Faugères, Caussiniojouls, Fos, Roquessels, Laurens, Autignac and Cabrerolles: villages at the foot of the Caroux-Espinouse massifs, located between garrigue and forest in the heart of a remarkable natural heritage. The terroir of the vineyard, exclusively schist, gives the wines of Faugères a unique character: the expression of a natural environment as beautiful as aromatic (garrigue, oak, cistus ...) These schist wines honor their reputation as Grands Vins du Languedoc By the search for the excellence of the winegrowers of the Faugères appellation. The great cuvées are distinguished by bearing the mention Faugères, Grand Terroir de Schiste. Nearly half of the vineyard is grown in Organic Farming, or in Biodynamics. The red wine Faugères displays a beautiful garnet color, slightly violet in youth. It reveals extremely complex aromas, red fruits and black incense, pepper and thyme. With age, the aromas intensify to reach the leather. 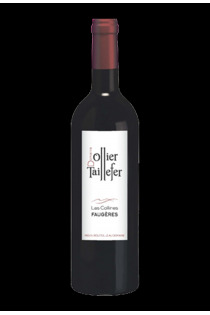 Tannic, powerful and structured, the red Faugères has good potential for keeping. Like many wines from the Mediterranean, the red Faugère comes from a blend of grape varieties; Syrah, Mourvèdre, Grenache basically. Very very mineral, the white wine of Faugères strongly expresses the schist of the terroir. Listed later in the Appellation d'Origine Contrôlée, the white of Faugères results from a mastered blend of Roussane, Vermentino, Grenache Blanc and Marsanne grape varieties. Rich in aromas of fruit, flowers and spices, Faugères white accompanies appetizers and grilled fish. Originated from the same grape varieties as the red wine, the rosé wine of the AOC Faugères presents according to the wines a dress more or less deep. The floral notes are subtly conjugated with the aromas of red fruits to give a gourmand wine, round in the mouth.